This online classroom is for the practicing electrologists who use the computerized epilators. Today’s modern electrologist must be more observant of the need to introduce new technology to their practice that benefits your patient. Just turning on the epilator no longer offers the electrologists the skill needed to be able to fully understand the “Computerized Epilator” which allows the electrologist to fully evaluate the patients skin condition. In addition the computerized epilator allows the practitioner to measure the moisture level of the inside of the follicle and how it improves the treatment process. Until the recent invention of the computerized epilator in 1985 most electrologists never conceived or thought about the moisture levels of the interior of the follicle. Today’s electrologists are still using equipment that cannot measure the moisture of the interior of the follicle therefore they eyeball it and give it their best guess when it comes to setting the intensity and timing. In my professional opinion and expertise any electrologist in 2005 who doubts and denies that superiority of the computerized epilator should buy space at the Smithsonian and move right in. Since the invention of the computerized epilator in 1985, most electrologists have very little idea of the advantages or the concept of the computerized epilator. For an electrologist to utilize the computerized epilator to their full advantage you have to possess a complete understanding of histology and the structure of the hair and skin and its minute structures that means you have to be competent in the knowledge of histology. If you were one of those students who thought or said, “Histology, what do I need to know that for just to insert the needle in the follicle shaft just kill the hair”, you are in trouble. So this class will assume you paid attention in histology class and successfully passed it. With the introduction of computerized epilator the electrologist is actually able to measure the moisture inside the follicle. Being able to do this provides you with a simple understanding that the computerized epilator discharges the current only when it senses the correct moisture level from the interior at the base of the follicle. Having electrologists who are frustrated and fearful of the computerized epilator because of one known fact it will not discharge or fire the current to treat the hair unless the needle is inserted without the patients sensing it dead center at the base of the follicle. In addition if one knows their histology they are aware that the interior of the follicle from the top to the bottom of the follicle there are no nerve fibers inside the follicle shaft. So if your insertion is absolutely right on target the patient does not feel the needle being inserted in fact they feel just a little pinch or tingle of the electricity depending on which current you use. Furthermore areas like the chin, cheeks jaw line and neck my patients fall asleep. If you think that’s impossible read my written guarantee of excellence that I provide my patients. Every well educated and trained electrologist that has kept up with the times and modern equipment should be able to offer that same guarantee. For the record I have heard about a hundred electrologists say, “I don’t understand the computerized epilator there is something wrong with it and I want to use the old manual epilator.” Don’t laugh, I have seen electrologists spend $3000.00 for a computerized epilator only to give up and plug in the manual footswitches that come with it and revert it to the old fashioned manual way. What a waste of money, technology and equipment because the electrologist cannot understand they need to be retrained on this wonderful technology. Fact, if an electrologists insertion are poor the computer is not going to fire or discharge the current to treat the hair. Non-licensed electrologists are poorly trained and incompetent and they often violate proper electrolysis procedure and force the needle to get the current to measure any moisture. One of the best attributes of the computerized epilator is that it will not fire the current unless the insertion is perfect. This guarantees the patient a comfortable high quality treatment with superior results. Without one doubt the insertion delay is the first step of the computerized epilator and you will need to program it, and for your information I have mine set 2/10 of a second although some epilators allow you to set delay up to nine seconds. In essence a 2/10ths of an insertion delay means the electrologist has exactly that much time to insert the needle to the base of the follicle before the current is fired. Quite a few electrologists think 2/10 of second insertion delay is impossible however the hand is quicker than the eye and if you have excellent vision, eye-hand coordination, proper lighting, magnification and State Of The Art Computerized Equipment it’s a reality. When I need to clear large areas and depending on the length of the hairs I can often epilate 500 to 800 per-hour using the computerized electrolysis epilator that will verify it with the hair count at the end of the treatment. However, no matter what you set the “Insertion Delay” at if the epilator does not go beep with every treated hair and you constantly hear chirp, chirp, chirp chirp, that means you need to pull back and reappraise how you insert the needle. Without one doubt allot of electrologists are intimidated by the computerized epilator because it tests every electrologists skill level from the first insertion. If I had my way State Board Of Electrologists would use them for the practical examination because they will not fire the current unless the needle is inserted exactly dead center at the base of the follicle. Fact, if your insertions are not consistently accurate (dead center) the computerized epilator will flunk you in a heartbeat. You can say anything you want to but nevertheless for the record I know that well trained skillful seasoned electrologists are aware that the hand is quicker than the eye. Fact, for the computerized epilator to fire the current the electrologists insertions have to be dead center to the depth of the papilla one hair after another. 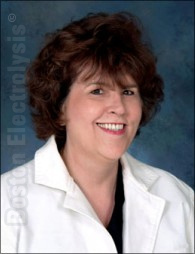 Quite a few electrologists have said, “Kimberly it was not easy but when I understood your concept of the perfect insertion it became easy and you should see how happy my patients are. Electrologists, whether you like it or not the computerized epilator is here to stay and those who still resist do not offer their patients the best possible treatment. Fact when you master the insertion for the computerized epilator you become a better electrologist and allot faster but with intense accuracy that cannot be denied. There is one fact you cannot deny with the required accuracy of the computerized epilator you patients clear up at an accelerated rate that you never thought possible. In addition to that there is no guesswork and your patients treatments are so much more comfortable because with accurate insertions coupled with the knowledge that you are now aware that there are no nerve fibers in the follicle your patients experience comfort. Setting your intensity and timing is the same as with a manual machine. However, there are technological insights you need to know about the computerized epilator and that is the coordination of insertion delay, intensity, timing and your insertion must be exact, smooth and follow the angle of the hair. In fact, if you look at the needle and the hair it should appear as one. Having sold and having taught so many electrologists to use a computerized electrolysis epilator here is a little trick that often works for electrologists who have trouble transitioning from manual to the computerized epilator. Take your footswitches and place them where you normally would, however do not plug them, now after you have programmed you epilator start the treatment focusing on your insertion depress the footswitch and insert the needle at the exact same time and all of sudden your computerized epilator just beeped. Why did it beep? Because you where focused on inserting the needle not your footswitches now do about fifty more hairs and kick away the footswitches and you will be amazed at how your practical application and expertise will improve by leaps and bounds. Computerized Electrolysis allows the electrologist to focus every insertion and by removing the footswitch your concentration while performing a treatments approaches a “Zen Like State”. You might think that is funny or little crazy however you should the results I get and how happy my patients are because they know I’m providing them the best treatment possible. To this very day practicing electrologists who refuse to upgrade to the computerized epilator while advertising they use State Of The Art equipment. Fact the Computerized electrolysis epilator is a blessing for the patients and the electrologists using it. The computerized electrolysis epilator has no footswitches that always mange to creep away from the electrologists feet during the treatment. In addition to that footswitches cause the electrologists to rock a little bit which makes your insertion more difficult. Fact, with the absence of the footswitch and insertion delay set just right you insert the needle with the greatest of ease and increased accuracy. Because, there is no rocking motion and how many electrologists have inserted the needle and they go to hit the footswitch and it’s not there. The treatment is interrupted while the electrologist is searching for the footswitches with her feet, which decreases your ability to focus. Fact, footswitches will give you arthritis of the ankle, muscle cramps and fatigue of the leg especially with short-wave application. With no footswitches your insertion is smoother and precisely accurate and patients comfort level is increased ten fold because the computer will not fire the current unless the needle is dead center at the base of the follicle where there are no nerve endings that cause pain. Fact, the computerized epilator demands your full attention at all times and that means you have to be focused 100% when you are treating hairs. However you are past that now and from that point on you will understand and learn these little secrets that the computerized epilator senses and measures the moisture at the base of the follicle. In addition, when you coordinate that with the insertion delay, intensity and timing you will be amazed at how your patients will say that was easy and also the fact that they clear up so much faster. That is what being an electrologist it is all about.